A longer version of this article first appeared on ArchDaily. To read that version, click here. It’s a global exodus that shows no signs of stopping: millions making their ways from rural outskirts to big cities, hoping for opportunity, money, or education. By 2008, half the world’s population were living in towns and cities; according to the United Nations Population Fund, that number will swell to almost 5 billion by 2030. Perhaps nowhere has this shift been more pronounced, or more associated with economic growth than in China. In only forty years, China’s population has gone from 20% urban to 51% urban, which translates to about 700 million people living in cities. However, in the West, where contemporary discourse on urbanization emphasizes the importance of low-impact, sustainable design, these ever-taller skyscrapers have experts concerned. With China so willingly hurtling forward in the name of progress, sustainability, ecological responsibility, and even health and safety have taken a back seat. From reports of “cancer villages” near dirty factories to constant threats of water shortages, an ever-thickening smog, and shoddy, life-threatening constructions, the repercussions of China’s “progress” has forced the country to acknowledge that its path cannot be maintained. Indeed, in the last few years the Chinese government has made conscious strides towards sustainability: their five-year plan for 2011-2015 emphasizes cutting down energy/water intensity and investing in clean technologies. Moreover, their goal relies heavily upon reforming the field of sustainable construction. Over 2.6% of China’s GDP (over $100 billion) is spent on the research and development of key industries in China, with the construction industry often receiving special attention. The country has even set up its own green certification system, the “three star” program, which will rival LEED. However, there are a few caveats to China’s commitment to sustainability. First, as Richard Brubaker, writing for the Guardian Professional Blog, explains, China’s top priorities remain socio-economic in nature: economic growth, urbanization, and the alleviation of poverty. Thus, it will be the tangible social issue of citizen health & safety, and not any ecological imperative, that will truly drive China’s path to sustainability. Second, for China, it’s not just a question of maintaining growth at all costs, but also of maintaining the image of growth. Architect Timothy Johnson, chairman of the Chicago-based Council on Tall Buildings and Urban Habitat (CTBUH), suggests that these buildings are really all about projecting an image, about “telling the story of the accomplishments of China.” Thus, the country will not want to sacrifice its image of economic accomplishment to achieve sustainability. No matter how much the West, and the world, may want it to. But must sustainability, economic viability, and “image” be mutually exclusive? Is it possible for China to build up its cities in a way that is at once sustainable, cost-effective, quick, safe, and, still, well, big? It’s a tall order – with an equally tall solution. Zhang, who started out manufacturing boilers and industrial air-conditioning units (and subsequently made his wealth), was inspired to shift his career to sustainable construction following two major life events: one, more than a decade ago, when he became a committed environmentalist , and two, in 2008, when a 7.9-magnitude earthquake hit China’s Sichuan Province, killing nearly 87,000 people. Despite initial censorship in the Chinese media, it was common knowledge that a large percentage of those deaths, particularly those of thousands of students, were the result of poorly constructed buildings. Zhang subsequently became obsessed with the idea of designing an earthquake-proof, environmentally-friendly structure. So Zhang conscripted about 300 of his engineers to the task. What they came up with was radical: the world’s first factory-built skyscraper. Over 93% of the Tower Hotel in Yueyang, Hunan, was prefabricated (as a series of modules) at Broad’s factory. Once on site, workers only needed to bolt the modules together: no welding, no scaffolding, no water (a typical construction site uses about 5,000 tons of water to build), and very little waste (only 25 tons, instead of the 3,000 tons usually created in skyscraper construction). The entire assembly process of a 30-story building took 15 days. And while the speed certainly raises eyebrows about the structural integrity of the skyscraper, the quality of the construction is actually the Tower’s greatest selling point. According to Lauren Hilgers, the Wired correspondent who spent time with Zhang Yue at the Broad Headquarters, “In a nation where construction standards vary widely, and where builders often use cheap and unreliable concrete, Broad’s method offers a rare sort of consistency.” In fact, according to Broad, the structure could survive an earthquake of up to 9.0 on the Richter Scale. Moreover, the Tower Hotel uses only 10% of the concrete required by other buildings its size, meaning it requires less structural steel (drastically reducing its total weight). Its exterior is comprised of thermal insulation and five-paned windows that keep the rooms cool. It can produce biogas from sewage and heat itself from hot waste water. It costs about $400 less per square meter than a traditional commercial high-rise in china. But Zhang isn’t satisfied yet. His latest project – if it succeeds – will be one for the record books. 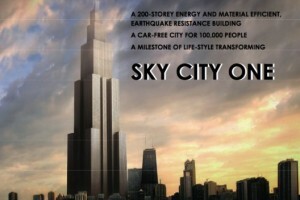 Sky City One will, at 2,750 ft (220 stories), be the world’s tallest structure, beating out the Burj Khalifa by about 33 feet. Like the Tower Hotel, it will be sustainable, earthquake-proof, assembled at Broad’s factory, and built quickly – in about 210 days (to compare, 9 times as fast as the Burj Khalifa) for only $628 million dollars. According to one of Broad’s workers, the idea is to “to attract eyes[…] to shock the world.” There will be little doubt of that. Even if you argue that the sheer size of the structure makes it a waste of resources, no matter how comparatively sustainable it may be, there’s no arguing that the height will call attention. It’s a strategic move to call attention to Broad’s construction revolution, which – if adopted on a large scale – would be a vital step towards China’s move towards sustainability. In a recent op-ed for The New York Times, Thomas L. Friedman points out that if China follows in America’s consumerist footsteps (or, as he puts it, adopts the “American Dream”), the use of resources will be such that we’ll “need another planet.” He describes a new “Chinese Dream” beginning to take form (and that he hopes take root), one which adopts from traditional values of harmony and balance, that redefines the concept of personal prosperity from ownership of products/services to access to them, and encourages sustainable habits. Should Sky City One reach completion, the world’s tallest tower will be a powerful symbol – not just of economic power, but also of China’s sustainable future.